Earlier this year we headed out to experience Puerto Maldonado, Peru. We were looking for an Amazon jungle tour from Cusco, as we had decided to cancel going to Bolivia. After comparison of the costs of getting to Puerto Maldonado vs. Rurrenabaque, we decided on a Lake Sandoval lodge in Puerto Maldonado, which is just near the eastern edge of Peru. We stayed for 4 days / 3 nights at Casa Sandoval, because I’m a big believer in non-travel days. What are those? Just days when you are not traveling in or out of the destination. I find that’s when you can really relax and appreciate the place. The itinerary was no different every day but the jungle is different every day so it was worth it. 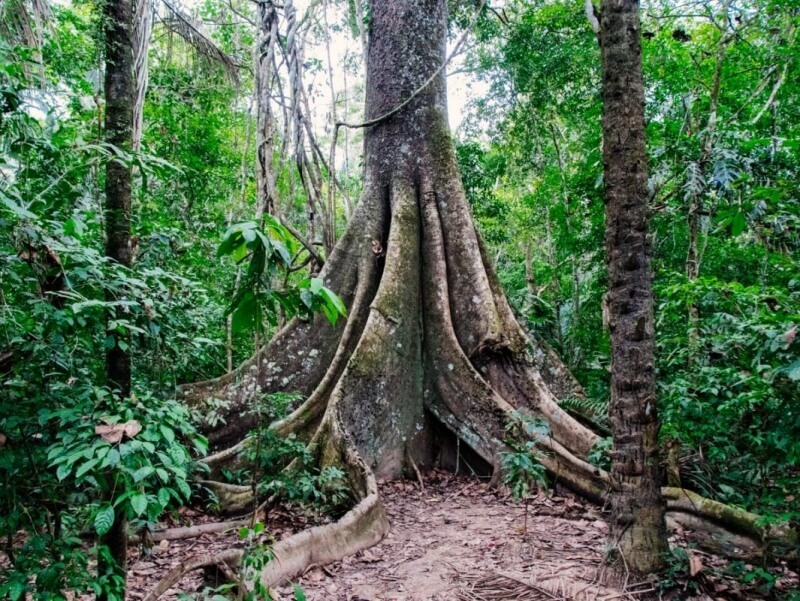 It was pretty dry in August but it can get quite rainy and muddy in other seasons – it is the rainforest after all. It’s remarkable how many different climates Peru has. The other wonderful thing was the joy of of being at a low altitude (just 600ft) and just breathing in all the oxygen the rainforest exudes. So reviving after Cusco’s insane elevation! We were so excited to find how accessible this tour was from Cusco. Getting to Puerto Maldonado airport is a short flight that costs around $100 per person. We left our luggage back at the hostel and headed out with just what we needed for the short trip. We had picked an outfit called Jungle Pro for this trip and the Lake Sandoval lodge we stayed at was Casa Sandoval. Jungle Pro was affordable and had great reviews and they did not disappoint at all. They are a small outfit but very professional all the way. Lake Sandoval is a horseshoe lake on the Madre de Dios river, which is now in a reserve called Tambopata. To get there, you fly into Puerto Maldonado, then take a motorboat to the edge of the jungle, then a short hike to the lake, and then a rowboat onto the lake. That seems like a lot? Well they make it pretty easy on you. When you arrive at the airport, you get picked up and head to their office. There you get a welcome drink to cool off and you pack a small duffel they will transport to the lodge for you. Any extra baggage, they tag and hold for you. So after this point, you don’t need to carry any luggage, just your personal stuff like camera gear, phone, wallets and passports. You also get nice solid boots to wear in case of any mud, although we didn’t get too much mud in August. With each stage you go deeper into the rainforest and further from noise and cars and pollution. The lodge we stayed at, Casa Sandoval, was simple but lovely. It had electricity for just a few hours a day so you basically rise and sleep with the jungle. I’ve never felt so close to nature. I’m a night owl and you’d think I would really hate the early wakeup, but somehow the excitement of heading out on a boat to see the jungle made it easy to wake at 5.00am. The first tour of the day is the early morning boat tour. You head out in a rowboat which is all that’s allowed to avoid harming the lake or scaring the wildlife. The rowboat is a pretty peaceful ride, so you can bring your camera with you, no need for waterproof housing. It didn’t rain while we were there but in the rainy season, you might want some protection for your gear. On the boat, you just have to be careful, you can’t really stand up in the boat ever, or at least until the guides say it’s okay to get out. Also try not to make big sudden moves. One guy had a really heavy backpack and every time he put it down, a couple of us would have to shift a bit to balance it out. I prefer to go with a lightweight backpack and turn it into a camera bag using an insert. 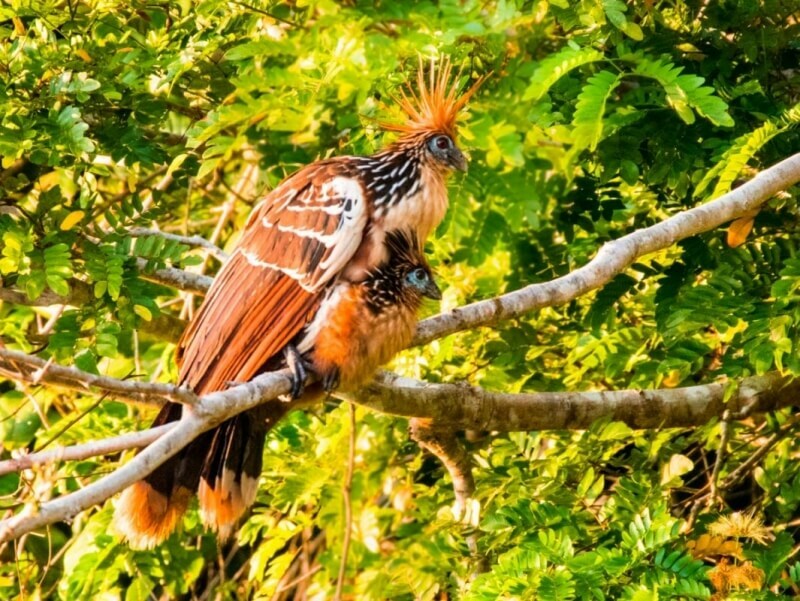 One of the most common birds is the hoatzin or stinkybird. This thing looks like, honestly, something out of Sesame Street. It’s ridiculous. It grunts, and huffs, it flies clumsily from branch to branch, and it smells bad. The amazing thing about it is that it’s old – like dinosaur old. Scientists think it’s the last surviving member of a species that branched off from other birds 64 million years ago, soon after the dinosaurs went extinct. 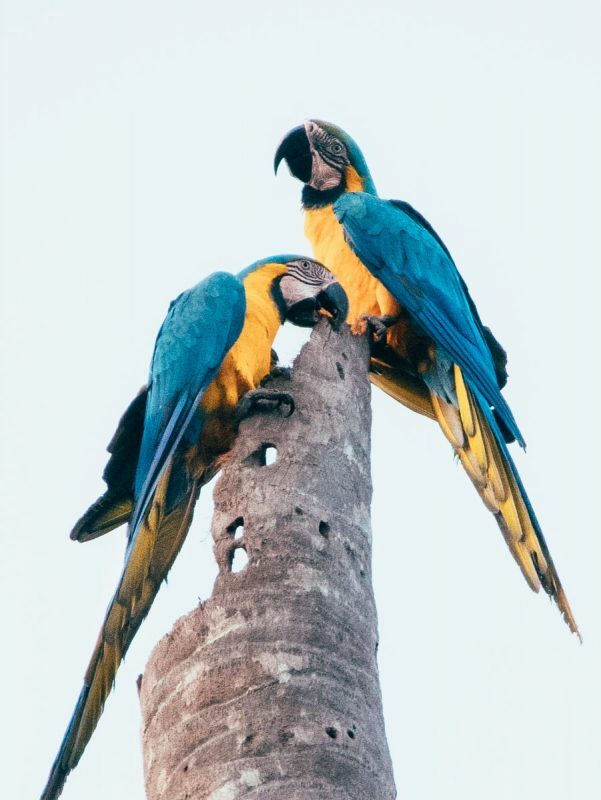 Another popular bird to look out for are the gorgeous and bright macaws. You can do a longer trip where you go to the Chuncho clay lick in the Tambopata and there are many more of these birds too. The tour we did to Sandoval Lake did not have access to the clay lick but we still caught some of these amazing birds. To shoot the wildlife, you need to always be ready with your camera. This is a good time to try burst shooting so you don’t miss the action. My camera, the Panasonic GX85, has a mode where it takes video and you can later select any frame of the video to capture into an image. I used that when it was especially hard to catch the action. You could also try using single point focus or tracking focus on your camera. I like single-point focus because you can pick the subject and avoid accidentally focusing on a branch behind the subject. Also it’s good to remember that this isn’t Disney, you may not always see what you want or what the guide was hoping to find, but that just adds to the sense of discovery. I love monkeys so I was really happy to see a lot of them, and have them be happily in the trees not foraging for garbage like you see in some tourist destinations. It’s one of the reasons this Amazon jungle tour, despite its proximity to Cusco, was so memorable. It retains its natural wonder and has not been commoditized with overtourism. At Lake Sandoval you can easily catch the noisy and adorable squirrel monkeys. Just watch for tree branches being jostled about. A bit tougher are the red howler monkeys. For all their early morning howling, they go quiet during the day and it takes the keen eye of the guide to notice them. If you have binoculars, that can make all the difference. We didn’t, but our guide was kind enough to lend us a spare – it’s quite amazing how sharp the good ones are. Here’s a guide to buying great binoculars. Once you do see them, they are often really high up in the trees so you need decent zoom on your lens, something along the lines of 300-400mm. I got some mediocre shots of them due to the distance, but I was still pleased to have caught a few. After a solid breakfast, we headed out each day for an easy hike in the jungle to get a feel for the flora and fauna of the rainforest. On these walks, we saw a lot of interesting trees and the stuff that live on them – spiders, frogs, caterpillars. To get good shots of these smaller creatures, use as wide an aperture as you can and zoom in. The narrow depth of field will help isolate the subject so it really stands out from the background. In the evenings at sunset, we went out on the boat again to look for wildlife but also to just enjoy the sunset on the water. Don’t forget to just enjoy the lake and trees and capture some of the environment. It’s easy to get caught up with looking for wildlife but even the lake itself is such natural beauty. If you’re looking for an Amazon jungle tour from Cusco, I highly recommend this one. Not only did I get beautiful photos but we got so in tune with the jungle. I didn’t expect that at all. It was also helped by a lovely experience with the Lake Sandoval lodge called Casa Sandoval. I didn’t want to leave and I think I want to return. Which, given how big and beautiful this world is, says a lot about this beautiful place.